Since its inception in 1949, the USDA Rural Development loan has helped over 1 million home buyers obtain housing with little or no money down. In 2011 alone, 130,000 people benefited from the program. Read on to see how you can buy a home with zero down. Click here to verify your USDA home loan eligibility in minutes. The USDA home loan is available to borrowers who meet income and credit standards. Qualification is easier than for many other loan types, since the loan doesn’t require a down payment or a high credit score. Home buyers should make sure they are looking at homes within USDA-eligible geographic areas, because the property location is the most important factor for this loan type. The property must be located in a USDA-eligible area. Borrowers can search USDA’s maps to browse certain areas or pinpoint a specific address. If you are unsure if a property is eligible, check with a USDA loan officer here. Think your area is not eligible? Well, about 97% of United States land mass is USDA-eligible, representing 109 million people. Many properties in suburban areas may be eligible for USDA financing. It’s worth checking, even if you think your area is too developed to be considered “rural”. 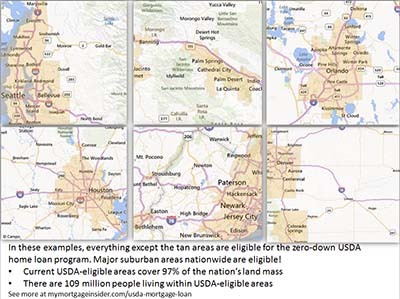 The USDA eligibility maps are still based on population statistics from the census in the year 2000. This is a unique opportunity to finance a suburban home with this zero-down mortgage program before the USDA updates their maps. Show me today's USDA rates. USDA had slated changes to its eligibility maps for October 1, 2015. However, according to a source inside USDA, map changes have been postponed. According to the source, eligibility maps are now reviewed every three to five years. The last review happened in 2014. That means the next change probably won’t happen until 2017 unless USDA conducts an unforeseen review before then. USDA runs on a fiscal year of October 1 through September 30. This is why most big changes to the program happen in October. For this reason, watch for a geographical boundary change on October 1st in 2017, 2018, or 2019. For now, USDA home buyers can rest a little easier knowing that homes they are looking to buy won’t suddenly be ineligible for the program due to boundary changes. For more information, see my blog post about USDA map changes. Hands down, the most important feature of the USDA loan is that it requires zero down. It allows for 100% financing of an eligible home’s purchase price. FHA loans require a minimum 3.5% down payment, adding thousands to upfront expenses. The no-money-down feature has allowed many people to buy a home who would otherwise be locked out of homeownership. Here’s your chance at a zero-down home loan. Apply here. The USDA loan is guaranteed by the U.S. government. Guaranteed does not mean that every borrower’s approval is certain. Rather, it means that USDA will reimburse lenders if the borrower defaults on the loan. The USDA backing removes much of the risk from the loan and allows banks and mortgage companies to offer a zero-down loan at incredibly low rates. On October 1, 2016, USDA reduced its monthly fee from 0.50% to 0.35%. Your monthly cost equals your loan amount or remaining principal balance, multiplied by 0.35%, divided by 12. Additionally, the upfront fee fell from 2.75% to just 1.00%. This is a good opportunity for home buyers to get lower monthly payments with this loan program. Guaranteed loans are available to “moderate” income earners, which the USDA defines as those earning up to 115% of the area’s median income. For instance, a family of four buying a property in Orange County, California can earn up to $110,750 per year. The income limits are generous. Typically, moderate earners find they are well within limits for the program. It’s also important to keep in mind that USDA takes into consideration all the income of the household. For instance, if a family with a 17-year-old child who has a job will have to disclose the child’s income for USDA eligibility purposes. The child’s income does not need to be on the loan application or used for qualification. But the lender will look at all household income when determining eligibility. Click here to verify your USDA home loan eligibility. The USDA loan offers just two mortgage choices: 15- and 30-year fixed rate loans. These are the safest and most proven loan programs. Adjustable-rate loans are not available. Private banks and mortgage companies offer USDA loans at very low rates. The USDA backs these loans, making it safer and cheaper for private banks and mortgage companies to lend. The savings are passed on to the home buyer in the form of lower rates. USDA loan rates are often lower than those available for conventional and FHA loans. Home buyers who choose USDA often end up with lower monthly payments considering higher mortgage insurance fees associated with other loan types. Show me today's USDA mortgage rates. USDA loans allow the seller to pay for the buyer’s closing costs, up to 3% of the sales price. Borrowers can also use gift funds from family members or qualifying non-profit agencies to offset closing costs when they supply this downloadable USDA gift letter signed by the donor. USDA loans also allow borrowers to open a loan for the full amount of the appraised value, even if it’s more than the purchase price. Borrowers can use the excess funds for closing costs. For example, a home’s price is $100,000 but it appraises for $105,000. The borrower could open a loan for $105,000 and use the extra funds to finance closing costs. Borrowers who don’t have all their closing costs paid for by the seller or otherwise need cash to close the loan will need to prove they have adequate assets. Two months bank statements will be required. There’s also a requirement that the borrower must not have enough assets to put 20% down on a home. A borrower with enough assets to qualify for a conventional loan will not qualify for a USDA loan. The program adopted new debt ratio requirements on December 1, 2014. There are no planned updates to this policy in 2018. Prior to December 2014, there were no maximum ratios as long as the USDA computerized underwriting system, called “GUS”, approved the loan. Going forward, the borrower must have ratios below 29 and 41. That means the borrower’s house payment, taxes, insurance, and HOA dues cannot exceed 29 percent of his or her gross income. In addition, all the borrower’s debt payments (credit cards, car payments, student loan payments, etc) added to the total house payment must be below 41 percent of gross monthly income. For example, a borrower with $4,000 per month in gross income could have a house payment as high as $1,160 and debt payments of $480. USDA lenders can override these ratio requirements with a manual underwrite – when a live person reviews the file. Borrowers with great credit, spare money in the bank after closing, or other compensating factors may be approved with ratios higher than 29/41. Click here to check USDA rates. New credit score minimums went into effect in 2014 and these will be carried over into 2018. Before the change, USDA loans could be approved with scores of 620 or even lower. As of December 1, 2014, USDA set a new credit score minimum of 640. This is not really a big change, since most USDA lenders required a 640 score prior to the official USDA updates. No money down loans appeared to have vanished during the housing bust, but USDA loans remained available throughout that time and are still available today. The growing popularity of the USDA loan has proven that zero-down loans are still in high demand. Borrowers in designated rural areas should consider themselves lucky to have access to this low-cost, zero down loan option. 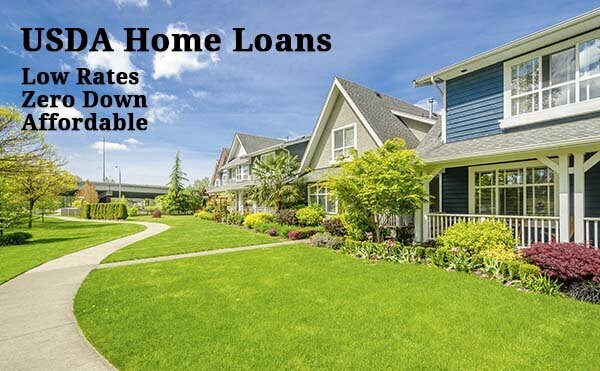 Anyone looking for a home in a small town, suburban or rural area should contact a USDA loan professional to see whether they qualify for this great program. I’m looking to buy a home in a suburban area. Should I still look into USDA financing? Yes. Many suburban areas across the country are eligible for a USDA loan. Complete a short online questionnaire to find out if your area is eligible. I thought USDA home loans were only for farms. Are USDA Loans Some Obscure Loan Type That No One Actually Uses? No. Thousands of home buyers use USDA financing each year. The program is getting more popular all the time. Below is a map of how many loans were completed by state in 2015. Does USDA offer a streamline refinance program? Yes. To qualify, the borrower must currently have a USDA loan currently and must live in the home. The new loan is subject to the standard funding fee and annual fee, just like purchase loans. Borrowers must qualify using current income, but may qualify with higher ratios than generally accepted if the payment is dropping and they have made their current mortgage payments on time. If the new funding fee is not being financed into the loan, the lender may not require a new appraisal. Can I buy a new construction home with a USDA mortgage? Yes. In fact, a new home should meet USDA minimum standards even more easily than will an existing home. Many housing developments are going up in USDA-eligible areas, making this loan a great choice for new homes. Apply for a new construction USDA loan here. Does USDA require the property to be in good condition? Generally, yes. The appraiser will state in the appraisal report whether or not the property conforms to minimum standards, which are the same property requirements needed for an FHA loan. Make sure your lender selects an FHA-approved appraiser who can verify the property meets FHA standards. Can I buy a condo or townhome with a USDA loan? Yes, however, the lender has to warrant that the condo or townhome meets FHA, Fannie Mae, Freddie Mac or VA requirements. The lender assumes a lot of liability by certifying that a condo project meets these requirements, so they may not be willing to approve USDA loan for a condo or townhome. USDA typically allows buyers to purchase new manufactured homes only. While pre-existing manufactured homes are typically not allowed, they may be acceptable if the current owner has a USDA home loan on the property. Ask your real estate agent for this information. New manufactured homes must meet certain thermal performance standards and be permanently affixed to a foundation. It also must have a minimum living space of 400 square feet. A buyer who is interested in a manufactured/mobile home should check with their real estate agent and lender about whether the home is USDA-eligible. Are USDA home loans only for first-time homebuyers? No. Buyers who have purchased before may use the USDA program. However, borrowers usually have to sell their current home or prove it’s either too far away from their work or otherwise is no longer suitable. Click here to verify your zero-down mortgage eligibility. Does USDA allow gifts to help with closing costs? Yes. Gifts can be used provided they are from a relative, charitable organization, government entity, or nonprofit. In some cases, a gift from a friend can be used if proof of the relationship prior to the loan transaction can be established. Applicants receiving a gift will need to complete USDA’s gift letter form. Download the form here. What’s the minimum credit score allowed for a USDA loan? USDA grants highest approval levels to those with a 660 score and above. On December 1, 2014, USDA set a minimum score for the program at 640. This was not a big change since most lenders had already set their own minimum score at the same level. I have no credit. Can I get a USDA loan? Can I finance my funding fee even though my LTV will be more than 100%? USDA does not consider the funding fee as part of its loan-to-value (LTV). So in essence, USDA allows for an LTV of a little over 101%. Why doesn’t every buyer use the USDA home loan program? Most homebuyers would prefer to do a USDA loan, but perhaps the areas in which they are looking are not USDA-eligible. Larger urban and surrounding areas are not eligible, since the point of the program is to encourage rural development. Still, a surprising number of developed suburban areas are still eligible. USDA home loan rates are low and free quotes are available now. Check your eligibility for this program and find out about USDA-eligible areas near you. Complete a short online request form to get started. Click here to verify your USDA eligibility. *Statistic per AskUSDA blog as of 2/28/2013. 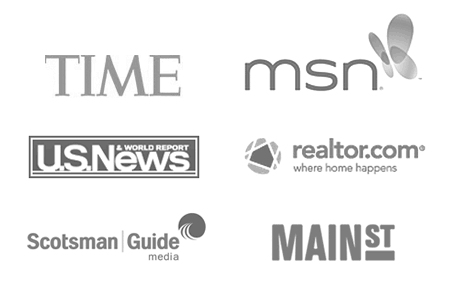 Next story The Complete Guide to Selling Your Home – Fast!